5 customer reviews, 100% of buyers said they were satisfied. Finding the perfect distance on the golf course can be complicated. Take advantage of the VPRO DLX 1KS with patent pending PinSlope Technology providing you slope compensation for uphill or downhill shots. Never be short or long again. Read more about our rangefinder technology below, see our reviews and remember LOVE IT or your money back! No need to second guess the distance with VPRODLX 1KS. Our waterproof laser golf rangefinder measures up to 1000 yards within +/- 1 yard, helping you find the right distance to golf flags, trees, or hazards. After one look through our premium, ultra-clear, multilayered optical lens, you’ll have a complete picture so you can take your golf game to the next level. 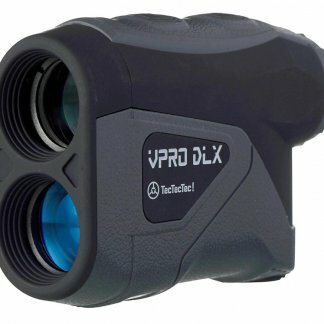 The VPRODLX 1KS uses the latest in rangefinder technology making it more accurate and flexible than any other golf rangefinder on the market. It measures distances perfectly thanks to its clear 6x magnification and multilayer coating. Our diopter adjustment functionality will always guarantee you a clear view whether you’re nearsighted or farsighted! Being able to see the object you’re measuring with clarity and pin point distance accuracy will only help improve your golf game. The VPRODLX 1KS is extremely lightweight weighing at 0.41 lbs and measures 4.1 x 2.8 x 1.6 inch making it very portable. With a rainproof body, there is no reason not to use it for every single golf swing, except maybe your putting! The golf rangefinder comes fully equipped with a premium case, free CR2 battery, wrist strap, microfiber cleaning cloth and a quick start guide for easy setup. The shock-resistant case safe guards your rangefinder against impact and poor weather. A flashy, high visibility, yellow design lets you easily spot your rangefinder when you need it. I tried a Bushmell, and Nikon rangefinder before using one of these in a golf tournament. Because of the precision in the VPRODLX, even without the slope feature there was no doubt I had to have one. Not taking away from the competitor models, this one was superior, eliminating any guess work. My friends who used were impressed that one said he would return his. Another with a Bushmell asked for my reading because his was giving false readings. Perhaps one awkward way to receive a compliment on your product was having to ask for it back. Great find especially for the price! My last comment:) But I hate 1 week old reviews. Meaningless. So this is an end of the season review. Hey!! It’s been three months now (see my July 26, 2017 review) This unit has performed flawlessly. I could not be happier with it. Time after time it has proved to be extremely accurate. Easy to use, still on my first battery, and the optics are first rate. I will keep posting as things progress. Lots of web based businesses seem “fly by night”. If TecTecTec had a brick and mortar close by, I’d be there in a minute. I am beginning to think the “10% sale pricing” is really the MSRP since there are sales all the time. But still worth the price. Just don’t fall into the pricing gimmick game. You don’t need to. The TecTecTec 1Ks is my first rangefinder that I’ve purchased. I found this finder in various golf reviews on the internet as this company was mentioned many times with positive reviews based on it’s pricing value. After considerable active use over the last month I’m extremely happy with this device beyond it’s lower pricing. I’ve compared it’s accuracy with my other golf buddies and is spot on. I also carry my iPhone with a GPS app that provides yardage estimates to the front, middle and back of the green. So using both, I’ve been able to get a better read. It took awhile to get use to dialing in the yardage as the printed instructions is very small print. But by pressing/holding the first top button closest to the viewing eye piece and starting from the left side of the pin and slowly pan to the left until you see the flag icon in your viewer then bingo. You have the yardage. Some of the higher priced viewers have a vibration mode when the flag is dialed in – but I do not necessarily think it’s necessary as I would be concerned with the extra battery drain. The accuracy of being within 1 yard is good enough for my usage. Some of the higher end finders have a 1/2 yard accuracy but that seems over the top for my ability at this time. The speed/performance of the device is very good as it takes no time to get a reading once I learned how to scan for the pin. The adjustable focus viewing lens works well for me to provide a clear view using sunglasses, eyewear or without. I have no problems in highly recommending this finder as it is well built, nice/balanced weight, nice secure storage cover,… So far functions flawlessly over this last month of high use. We will see how long the batteries last during the rest of this season but so far I’m pleased with the power utilization as it might be too early to tell. No reviews yet on this one? OK. So I’m new to range finders. I’ve tried the online GPS programs but if you don’t have cell service on the course you are out of luck. And it costs. Didn’t think I could justify the $400+ price tag of other name branded units so I went with the TecTecTec 1Ks. On every hole at my local course, (Turkey Creek Golf Course, McPherson Kansas. Yes I’m plugging! ), on every hole that was designated middle pin placement, I shot multiple readings from the tee on in. I’d shoot the 150 yd marker and the flag. On every one if I subtracted the distance to the pin from the distance to the 150 marker, I got 150 yards! And when I got to the 150 yard marker, guess what? I got 150 yards to the pin. It’s fairly flat in Kansas so give me some time to dial in the slope feature. The unit is solidly built, focuses perfectly to my “less than perfect eyesight” with diopter correction, and from order time to on my porch was faster than I anticipated. I don’t hold much to reviews made right after the purchase. How do you know if the product works for sure? Really? So I intend to follow up with this review in say………6 months, and give you an actual “in use” evaluation. In the mean time, give this unit some serious consideration!! I don’t think you will be disappointed.